In 1911 there were quite a few raids going on up and down the border. There was a revolution going on in Mexico and both sides fought back and forth into the interior and up and down the border. Along in 1912 it was quiet, but quite a few of these bandit gangs remained, robbing ranches, stealing cattle and horses. In 1913 and 1914, these bands were rather numerous up and down the Rio Grande, from Laredo to Brownsville. In fact, that fight went on up and down Texas, New Mexico and Arizona. 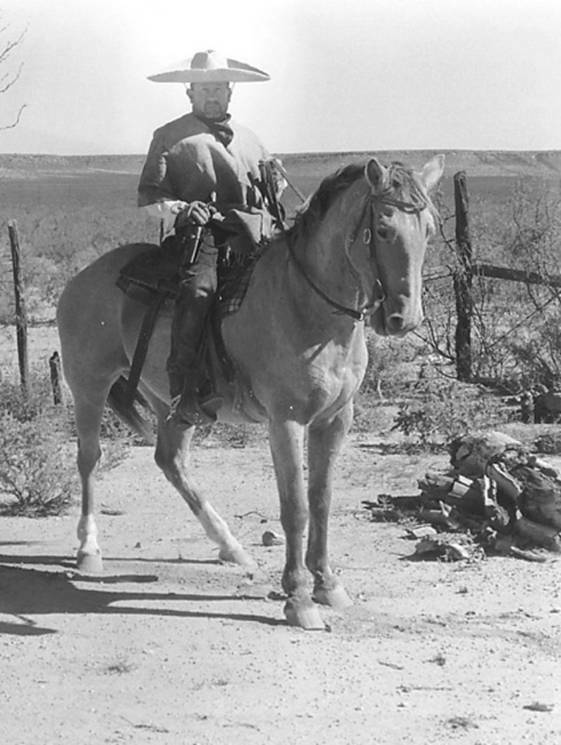 These border bandits were supplying both sides with cattle for beef and horses to move troops. 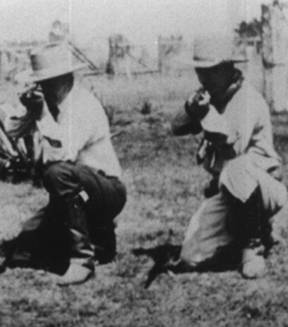 Diaz, Huerta and Carranza were fighting for control of Mexico, and Villa and Zapata were leading groups of guerrillas. They came over here and took anything that wasn't tied down. There were a lot of white men that certainly didn't sprout any wings. They were just as rough as those Mexicans. It wasn't all Mexicans, it was both races that played that border country, trading with one another, stealing from one side and taking it to the other, then come back over here. Just back and forth across that border. Soldiers were stationed all up and down the Rio Grande, but they didn't have too much effect on the bandits due to the fact that they were under strict orders and regulations and could only go so far. In the spring of 1914, I was working only about eighteen or twenty miles from the Mexican border. Every once in a while these border bandits would catch a cowboy out there alone and take his stock, steal his horse, take his clothes and his boots and leave him naked out there in that brush, which is pretty hard on a boy 15 or 20 miles from the ranch headquarters. Now and then they would kill one. They killed several boys that I knew. They were a pretty ornery bunch, and it was dangerous not to be safe down there for a long time. We had troops in Del Rio, but those old soldier boys couldn't do much to stop them. The army expected to find a bandit behind every bush. Those Mexicans knew just how to get away from them. Why, they could lie down and watch those soldiers pass within a hundred yards. Those Mexicans played all around them. They would drop right in behind them and burn a ranch or steal some cattle. When they brought the Rangers in there, they stopped a lot of it. They killed lots of Mexicans and several innocent ones that I knew of. The Rangers differed from the soldiers in that a soldier would yell, "Halt!" and then shoot. The Rangers shot and then yelled, "Halt!" It was just as rough as the dickens there for several years, and the bad part was that I was right in the middle of it. For a while there, the Rangers got bad to set traps for the bandits. They usually liked to get around windmills or water holes and wait for a bunch of them to come in there and water their horses. They'd open up and get as many of them as they could. They also liked to watch gates. There were no cattle guards in that country. You always went through a gate. Most of them were pole gates. They took a big mesquite post on each side and bored five or six holes in it and ran poles through them. To open it, you had to get off of your horse and slide those poles out, pass through, and put them back in. It wasn't too long before the bandits started setting traps for people, too. A lot of men lost their lives opening gates. One morning, Mr. Lane (the owner of the Guadalupe Ranch) sent me to Monte Cristo to pick up a wooden box that was being dropped off for him at the depot there. I was driving a two-wheeled gig with a team of horses. I drove up to the depot and the man there helped me load a big, wooden crate. Lane didn't tell me what was in it, but he just said that it was important goods and I wasn't supposed to fool around, I was to come straight back. I didn't know what it was, I just knew that it was heavy. I went through three of those pole gates before I got back. When I returned, Lane opened the box and all of these Krag rifles and ammunition fell out. I nearly got sick to my stomach when I thought about those gates I had passed through. Why, someone could have stuck a gun in my side in five seconds and there wouldn't have been a thing I could do about it. That's just how serious it was all over that country. We had been gathering horses and had several manadas of bell mares and stallions in a small pasture. Well, those bandits had been informed as to what we were doing. That evening we had all gone to bed. It was a beautiful moonlit night without a whisper of a breeze. A Mexican rode up and called out for the ciamanga or boss of the ranch. Old man Sam Lane put on his pants and stood on the porch to talk with him. This fellow told him that there would be a band of Mexicans coming in to raid our ranch for horses that night. The old man came back and woke up all of us and told us to get all of our guns and ammunition and meet him down on the west side of the ranch house. He didn't wake this bunch of Mexican cowboys we had there, because they hadn't been on the ranch too long and Lane didn't know if he could trust them or not. There were a lot of good Mexicans on this side of the border that helped us out, but unless you knew them real well, you might be sticking your neck out to trust them too much. We met Lane at the corral and hid under the shadows of a big mesquite tree. The old man, who was a very good shot, told us to keep quiet. "They will come in here and water their horses and look around before they do their devilment. You watch the gate and I will be back over by the water trough. I'll shoot first and kill some of them before they leave the trough. You get the rest of them as they funnel back through the gate." We crouched down and waited until almost four o'clock in the morning and no one showed up. One of the boys slipped up to the house to telephone the Ranger headquarters at Monte Cristo. No one answered, so we knew that they were still out in the field. We went back to the ranch and had breakfast and along about daylight, the Rangers drove up in two Model T's. "What happened to you boys?" old man Lane asked. "We run those fellows off," they replied. "We didn't intend to, but we were hid down there about four or five miles south at a windmill. These bandits rode up to water their horses and saw the reflection of the moon off of our windshields and turned and ran. We shot into them, but I don't know if we hit any of them or not." They came inside and had a cup of coffee and then went on their way. After that scare we decided that it was time to build some kind of a fort around this ranch house, so we gathered up all of the old windmill tiers, irons, sacks filled with sand and anything that we could find that would stop a bullet and built a wall about four feet high and four feet wide all around this ranch headquarters. We took turns standing guard. It went on this way through the summer and fall of 1914. 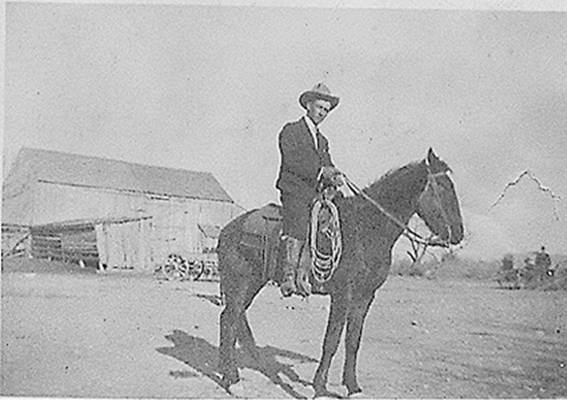 In the summer of 1915, we were leaving out early one morning to gather some cattle that were twenty miles east of the main headquarters. There were five of us with sixty saddle horses. We passed in front of what is known as the McAllen Ranch. There was a strong southeast wind blowing as we were moving to the east. About the time that we passed this McAllen Ranch, there were fourteen Mexican bandits there who had come to kill old man McAllen. McAllen's family lived in Brownsville where they had a nice home. He stayed out at the ranch during the summertime and had a Mexican woman cook and a girl there. This girl had come across the river looking for a place to hide from the revolution. He gave this girl a job to take care of the house during his absence and keep it clean when he was there. This girl's parents back in Mexico did not care a lot for these living arrangements. 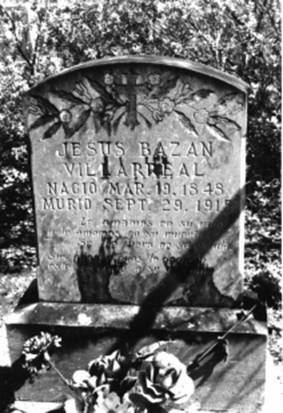 These fourteen Mexicans had been sent in there by that girl's family to kill old man McAllen. I'm probably the only person alive today that knows that it was a contract killing. But they went about it all wrong. They were the dumbest bunch I ever heard tell of. They could have killed him with one shot, but instead they rode up to the headquarters and called for McAllen. The old man took them for their word and he got up to leave the ranch. The Mexican woman begged him not to go, saying that if they really had 80 men they would have brought them in the first place, and they were gone, not to come back. But he left the ranch and wandered out into the brush. Sam Lane, the boss of our outfit, heard all of this shooting. He knew there was trouble over there, but when we left the ranch that morning we only left one man with him and after we left this man had to go to the lower part of the ranch to check some windmills and wouldn't be back until two o'clock. Lane tried to phone the Ranger station, but the bandits had cut the line 56 times. The old man was ruptured badly and couldn't ride a horse very long, but when this other boy come back to the ranch, he put him on a horse and sent him to the Ranger station at Monte Cristo. Captain Ransom, out of Houston, had a Ranger company there with nine Rangers. The Mexicans who had raided the McAllen place came out about 300 yards from the Guadalupe Ranch headquarters and stopped on a little knoll for a bit. Old man Lane thought they were coming for him, but he was well-prepared for them, and had they decided to come into his ranch, several of those old boys would have suffered, because Lane was a good shot and was waiting for them. But they didn't come in. He watched them ride away. The Rangers didn't get back to the ranch until dark. They like to never found old man McAllen, but they did and brought him back in and got what information they could from him and that Mexican girl. Old man Lane begged them to go on to the border and drop a man off at each crossing, because he knew that they would cross the river that night. It was a full moon and they would have no trouble seeing them. Captain Ransom wasn't as familiar with that border country and thought that the bandits would stop at some of the ranches in the area. What they had done was to ride over to a little Mexican farm about three miles from the Guadalupe headquarters. Those Mexican peasants took them in, dressed their wounds and fed their horses. If they hadn't, the bandits would have killed them. The Rangers finally decided to take Lane's advice and went back around Mission and up the river to Los Ebanos, a little village on the border. They got up there around four o'clock in the morning. The only light that they saw was an old Mexican woman living alone, sitting there drinking some coffee. They rode up in their Model T's and when they got out, the lady invited them in. They waited for daylight and tracked the wounded Mexicans by their bloody rags and horse tracks, and every man they found they killed, drove off and left them there. They came back to the Guadalupe Ranch about eleven or twelve, and they had been out all night long. As soon as they ate some dinner, old man Lane threw them some blankets and pillows and they spread out all over the porch and were asleep inside of ten minutes. About one o'clock that afternoon, those Mexicans that had aided the bandits rode up to Lane's ranch and called him out. What was said between them we never did know, but they turned and rode back to their farm. The captain of the Rangers recognized them and waited until they got about 300 yards from the headquarters and began to follow them. These two Mexicans pulled over to the side of the road to let them pass, and when they did, the Rangers just shot them off their horses, turned around and went back to the ranch and went back to sleep. About two days later we could hardly sleep because of the stench. Human scent is the worst in the world. We went over there and found their bodies still lying where they had been shot. We buried them the morning of September 29, 1915. Their horses wandered back to their farms, and when the families found out what had happened, they pulled up everything and left, never to come back. Their graves are still there. There is a highway that goes through that part of the country, and they are on the right of way, marked. What had happened was the Rangers had found some bloody rags at their place and they killed them for lying to them. These Mexicans were afraid that if they told the Rangers anything, the bandits would kill them, but if they hadn't helped the bandits, then the bandits would have killed them then. They were right in the middle of it and didn't know what to do. You felt sorry for them. One of these men I knew real well, 67-year-old Jesus Bazan. He lied to the Rangers because he was afraid to tell the truth. He knew what those Mexican bandits would do to him and his family if they found out. It was some mighty dirty work going on then. None of this stuff ever got in the papers and no one investigated it as far as I know. There were so many innocent people killed in that mess that it just made you sick to your heart to see it happening. If those ranchers caught a Mexican with a bunch of cattle, they didn't ask him where he got them, they killed him. I knew of one time when they hung 18 men in a grove of trees. A man's life just wasn't worth much at all.